Even in this current world of complete openness in rap, Kevin Gates’ Islah stands out as honest. This is still very gangsta rap and Kevin Gates has the credentials for it, but it’s also tender and human in the way 2Pac was. I can’t think of another rapper who would admit to giggling, but Kevin Gates throws it out there without the slightest trace of embarrassment. His voice and his music, however, keep the listener from ever doubting his toughness. His “I go to war behind you” line from “One Thing” is his album in a nutshell; loving and sincere, but in no way soft. Musically, Kevin Gates does everything on this album and does it well. Most of the hooks and the verses are his, and those few that aren’t, like the hook in “Kno One”, are some of the weakest points of the album. There’s a little too much filler here for this album to be a classic, for instance “Jam” is just boring, but there’s enough high quality rap here to suffice all but the most demanding of listeners. Humanity is an essential part of gangsta rap, but one that’s criminally underserved. 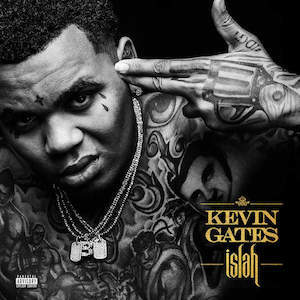 Islah puts the complete Kevin Gates in the light and makes for fantastic rap in doing so.